Στο συνημμένο αρχείο θα βρείτε το μήνυμα με τις πρωτοχρονιάτικες ευχές του Προέδρου της Ευρωπαϊκής Ακουστικής Εταιρείας προς όλους τους συναδέλφους και φίλους της. Here we are at the beginning of another year. At this very moment and on behalf of EAA Board I want to wish you the best for the New Year of 2018. The start of a new year is the perfect time to set up our perspectives, intentions, and make the plans for the future ahead, establishing the corresponding commitments. 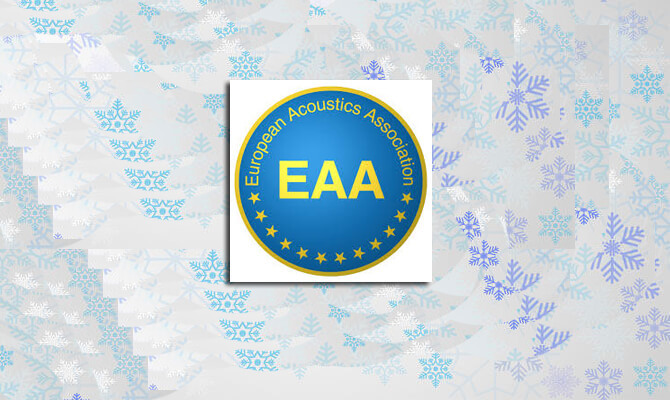 Founded in 1992, EAA has done its best for the promotion of Acoustics and their related matters to the benefit of all community. Being an adult Association - for it has celebrated its 25th anniversary last year - EAA has a great responsibility in bringing together researchers, companies, labs, universities, agencies, and citizens, under the same umbrella of scientific and social development. Next year, from 27th to 31st May 2018, it will be held, in Crete, Greece, another important EAA event, the EURONOISE2018, organized by our colleagues of the Acoustical Society of Greece (HELINA)1. Technically, this event will feature a large amount of topics and special structured sessions which will be of utmost interest to all participants. The most part of EAA technical committees are deeply involved in the organization of special structured sessions, and we expect a large participation of Colleagues from European Countries, and also from abroad. Socially, a dedicated program is addressed to enjoy and taste the delights of Greek culture, hospitality and gastronomy. I’m sure the EURONOISE2018 will be another great success not only for EAA, but for all of us. In this frame let me remind you that prior to this event, there will be held the EAA General Assembly, which I hope will be attended by all of you. I also must never forget the success of the last International Noise Awareness Day (INAD), and the Pan-European Competition for students coordinated by EAA. For this year, and based on the gained experience, I suggest all Societies promote dedicated activities under the motif of INAD, involving young students, governmental agencies, media, and citizens in general, in order to put on the agenda, the needs for a better future noise environment. The EAA Board is envisaging a meeting during EURONOISE2018, in which the interested Societies could report and present the activities they have developed for INAD in 2018, in their own Countries. As usual, the INAD is celebrated on the last Wednesday of April, being this year on the 25th. I would also like to make reference to the World Hearing Day, promoted by the World Health Organization (WHO), which will be celebrated this year on March, the 3rd, and to the engagement of EAA in the 9th European Commission Noise Experts Group, whose function is to give inputs to EC for the revision of the existing Environmental Noise Directive (2002/49/CE). As usual, the EAA products, Nuntius, Acta Acustica, Schola, Acoustics in Practice, Documenta, will continue to be issued, produced and published, by spreading information (scientific, technical and social) of interest to all community through its member societies and its webpage, thus fulfilling the duties and responsibilities of the EAA. Again, I want to make a special reference to the YAN (Young Acousticians Network) and for the importance of their role, not only in Europe, but also around the world. This is a remarkable example of what an association do for the sustainability of its future. By other side, EAA have given its agreement to several applications submitted requesting their events to be EAA Symposia, and has also given its institutional sponsorship to other events, all to be held in 2018, in accordance with our internal regulations. Before ending this letter, I want to stress that we have a very important issue to deal with. It will be the process of moving our Journal “Acta Acustica united with Acustica” to Open Access system. This process is coordinated jointly by the EAA Board and the Journal Editor-in-Chief. We hope to succeed in the process and keep our Journal as a reference for colleagues who would like to publish their findings and research results in a good and well referenced publication. Nowadays, the times we are living seems to be stressful and dangerous. Strong and dark winds blow from everywhere. But the Human Race has overcome so terrible times before, so that I’m confident we will surpass this fear once again. A sense of hope must always be in our minds and a word of love in our mouth. As usually happens, time flies. In fact, time runs so fast that, without noticing, the end of this year will caught us just around the corner. Therefore, why not start thinking in 2019, since it will be the year for another EAA event, the EUROREGIO 2019, which is planned to be held in Aachen, Germany, jointly with ICA2019, from 9th to 13th of September?